Panel track blinds, which are also known as sliding window panels or panel tracks, are a great choice for patio doors, large picture windows, or sliding glass doors. These stylish window panels have large fabric panels which hang vertically and slide on tracks to open or close. They are available in many fabric colors, styles, and patterns, including woven wood. They can slide open to the right, to the left, or split open in the middle. You can also have valences, privacy liners, blackout liners. 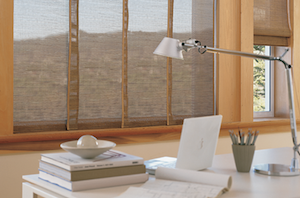 Panel track blinds are a type of vertical blind.